Tall Gourmet Window Boxes can be filled with an assortment of goodies such as popcorn, pretzels, nuts, wrapped candies, cookies, pet treats, jarred products and taller gift. Add ribbon or bow and you've got a nice looking gift. 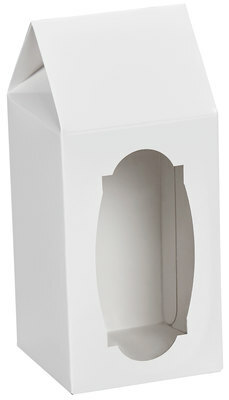 Sturdy paperboard container. Glossy outside and matte white on the inside. These boxes have an automatic bottom and the tuck lock lid that closes in the back, and has a large acetate covered window for great visibility of your product. Made with food grade paperboard but unwrapped goodies should be placed in a FDA approved cello bag.